In THE PRINCESS SPY, Melanie Dickerson delivers another wonderful book–beautiful inside and out! (That cover. Seriously. It’s one of my favorites.) I was a little worried the story inside could not live up to the gorgeous cover, but it did. Oh, did it ever. One of my favorite things had to be the fact that the hero is from England and speaks no German, but finds himself in Germany where nobody speaks English–except the heroine, who only speaks a little. Everything resulting from that basic premise was alternately fun, hilarious, awesome, and sweet. I must say the author did a fabulous job of presenting the struggles of a foreigner in a land where he doesn’t understand anyone, and vice versa. Colin and Margaretha’s relationship having to do with the language barrier was absolutely adorable. I LOVED that aspect to the story! That alone makes THE PRINCESS SPY a favorite. As far as Margaretha herself, I enjoyed her as a heroine, which is a compliment to the author, who must be one of the best writers of girl main characters, because I actually like the heroines in all the books I’ve read by her. One of my main problems with reading stories with a romantic tilt to them (or, any book, actually…), is loving the male character but finding the girl annoying, unlikeable, or, in certain cases, hating her. So I’m glad that Margaretha was actually likeable, and fun, and it’s amusing how talkative she is. And then Colin. Yes, once again there is an awesome hero who we fall in love with a little… or more than a little… I think it took me a bit longer to get a feel for him as a character (instead of instantly knowing his character like with Gabe and Valten) but in another way I loved him from the first I saw him! So… I don’t know. Suffice it to say I loved every minute (page?) with him and wished the story was longer so I could read more about him! Now, I did feel like the fairytale-retelling aspect of it was not the strongest. In the other two books I’ve read by Melanie Dickerson, one of my favorite things about them was the fairytale part. As a retelling of the Frog Prince, it seemed to be grasping a little, almost as if it was forced into the story for the sake of being called a retelling. Yes, there’s a scene involving something dropped in a well, and the character gets called Frog-boy briefly because of some unfortunate green clothes, but that’s all I noticed (though I might be missing something). Then again, there’s not much to the original Frog Prince story anyway. The title seemed slightly forced as well. The spying wasn’t too much of a focus except very early on, and Margaretha is technically a duke’s daughter and not a princess… But at the end of the day neither of those nit-picks matters much because, regardless, the story is awesome. Even without a strong fairytale plot, the book was good in itself and I really loved it. The experience of reading THE PRINCESS SPY will be enriched by reading the other books in the series first–for instance I may have squealed in delight whenever there was a reference to Gabe from THE FAIREST BEAUTY, or whenever Valten (the hero of THE CAPTIVE MAIDEN) came on the scene… And I’ve yet to read THE HEALER’S APPRENTICE or THE MERCHANT’S DAUGHTER, but I can tell that they would add to the story if I had read them already (soon, I hope!). But really, I think THE PRINCESS SPY stands alone fairly well. Bottom line: With an interesting and exciting story, beautiful writing, and characters we love, THE PRINCESS SPY is thoroughly worth reading (as long as you don’t expect there to be too much of a fairytale retelling or a whole lot of spying). 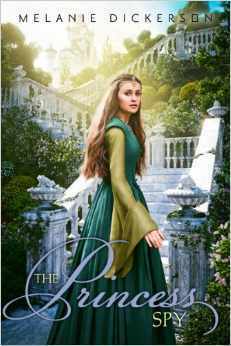 It’s a really good tale for anyone, but especially for older teens and lovers of a good fairytale-esque romance adventure in the forests and castles of medieval Germany. I enjoyed it a ton, and I can’t wait to read more by Melanie Dickerson! The Princess Spy will be releasing in just a few short weeks on November 4! So mark your calendars, or better yet, pre-order it! Aaaahhh!!! I love this review! So good! I MUST get my hands on her books. I can’t believe I’ve never read any of them. Disgraceful! I’m so excited for The Princess Spy! I’m glad to hear you think it’s a good book. 😀 And you should definitely read The Healer’s Apprentice and The Merchant’s Daughter. They’re my two favorites in the series. *nods* The Healer’s Apprentice takes place before Fairest Beauty and Captive Maiden, in the same town. The Merchant’s Daughter takes place in England, and it doesn’t seem to have any connection to the other three released books, but I have suspicions concerning it and this one. You just confirmed my suspicion, and that makes me VERY happy. The Merchant’s Daughter is pretty much my favorite in the series (as well as the only one I actually own . . . the rest I just borrow from the library). Ooh, I’ve read The Healer’s Apprentice . . . but that’s as far as I’ve gotten so far. 😛 This looks good! My sis is further along in the series than I am; I think she’ll be interested too. Yeah, it looked like the fairy tale aspect might be weak–but hey it’s a good romance, that’s always fun. I really enjoyed this book, too! I hadn’t even realized it was supposed to be a retelling of The Frog Prince, so…yeah. 🙂 Which is your favorite of her books?